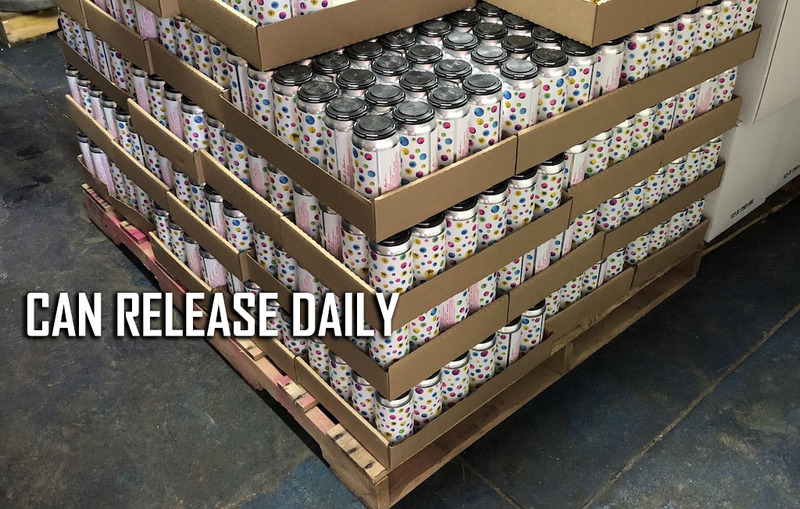 Can Release Daily 12/6/18 – Titled Barn, Altmont, Moksa, WeldWerks & More! Here is the latest edition of Can Release Daily. We’ve always appreciated centralized information, and here we have some of the hottest can release drops around the country bundled in one post. We understand that these cans might be long gone by the time you read this, we hope this also serves a purpose by showing you what you might want to trade for in the next week or two. Please give us feedback on who we should be looking out for. Here is some info from Titled Barn Brewery, Altmont Beer Works, J. Wakefield, State Brewing, Pure Project, Moksa, 450 North, Wren House Brewing, Odd13, WeldWerks and Highland Park Brewery. Christmas is coming early to the Barn this week with a big four brand weekend. We are very excited to bring back Double Dry Hopped Chosen One this week. Featuring a huge melon sorbet profile, this beer is intense, yet beautifully balanced. 100 cases available, two 4-packs pp limit. We also have the second batch of Fermented #5, our petite wheat farmhouse ale. This beer is brewed with Pilsner malt, flaked wheat, and malted white wheat, and our farmhouse yeast. Clean, crisp, and silky smooth, 70 cases available and 18 cans pp limit. We also have 45 cases of Violet and 15 cases of The Other One carried over from last week and available at 18 cans pp on each. Plenty of options available for onsite pours and tastings with DDH Chosen One, Other One, Raffi, Violet, Milo’s Phoenix, Fermented #1 (Rye Pale Ale), Fermented #5 (Petite Wheat Farmhouse), Fermented #6 (Nelson IPA), and Peeptoad. See you Thursday 5-8, Friday 12-8, and Saturday 1-4. Don’t forget to bring a new, unwrapped toy for our Toys for Tots campaign and receive a free 10 oz pour on us! Cheers. STRAWBERRY BOMB BOMB Saturday, December 8th – 12PM **Small Run Can Release** 🍓💣💣 If you’re a fan of Family Julius then this one is for you! Strawberry Bomb Bomb is a Hazy IPA with an explosion real strawberry flavor followed by a shockwave of creamy vanilla beans & lactose. Dry hopped with over 5 pounds per barrel, it’s the perfect blend of IPA and strawberry shortcake 🤤 ⠀⠀⠀⠀⠀⠀⠀⠀⠀ We’ll be selling cans on a first come serve basis out of Unit 2 like last weekend. Yield and limits will be posted later this week. Looking forward to see you on Saturday! We juiced the Juice Hunter! We’re releasing our first fruited variant of our flagship Double IPA, Intergalactic Juice Hunter, on December 15th. We are also releasing Time Stans Still, a Stan Lee tribute IPA, and St Newcole. We’ll be sharing more details regarding the release next week. Guava Intergalactic Juice Hunter is a double IPA hopped with Galaxy, Amarillo, and Simcoe. We added 1 lb per gallon of guava. The guava really pops and pairs nicely with the pineapple/citrus fruit character from the hops! Five new cans dropping tomorrow! SKYLINE DAYDREAM Collaboration beer with our friends from @otherhalfnyc half out of Brooklyn, NY. This 8.5% ABV New England-style Double IPA features huge additions of Galaxy, Simcoe, & Idaho 7 hops. When Brooklyn visits Greeley, magical things happen! $16 per 4-pack, limit 6 x 4-packs per person, TAPROOM EXCLUSIVE EAST COAST FACEPLANT Collaboration beer with our friends from @nibrewing with a portion of proceeds benefiting J.O.S.H., a nonprofit organization dedicated to helping youth develop confidence, self-esteem, and optimism for a bright future. We riffed on New Image’s East Coast Transplant flagship IPA, and the end result is an 8.5% New England-style Double IPA brewed with passion fruit, guava, vanilla, lactose, and Citra, El Dorado, & Simcoe hops. New Image is one of our favorite Colorado breweries and we had a blast working with them to produce two totally different but equally delicious beers. $16 per 4-pack, limit 3 x 4-packs per person ALPINE CHATEAU 8.1% Imperial Milk Stout brewed with milk chocolate, milk sugar, cocoa powder, marshmallows, & 150 lbs of @swissmissph hot cocoa mix. We won’t judge if you decide to warm it up, add some marshmallows, and sip it by the fire. $14 per 4-pack, limit 3 x 4-packs per person FROSTED TIPS 8% ABV New England-style Milkshake Double IPA brewed with milk sugar, vanilla, spruce tips, & 100% Chinook hops. Remember when frosted tips were in style? Neither do we. Fortunately this beer is perfectly timed for the season and tastes fantastic! $16 per 4-pack, limit 6 x 4-packs per person, TAPROOM EXCLUSIVE CRANBERRY GOSE 4.5% ABV Kettle-soured Wheat Ale brewed sea salt, coriander, cranberry, & aronia puree. Bursting with cranberries and aronia berries, this seasonal treat offers equal parts complexity and drinkability. $14 per 4-pack, limit 4 x 4-packs per person All five new beers will be available on tap and in 4-packs to go starting at noon on Friday. We will also be tapping Bourbon Brandy Medianoche and Peanut Butter Cup Medianoche (which may not last long). And don’t worry about food, because we’ll have @hopandhoe food truck here all day. Is it Friday yet?! It wouldn’t be responsible of you to miss this Friday’s can release. _____ Irresponsible is back! This hazy 10% ABV Triple IPA is Hopped with 100% Nelson hops & packs a tropical punch! For a 10% ABV beer, this Triple IPA is immensely drinkable! _____ Friday’s can sale will begin at 2PM in our Chinatown taproom. Four packs will be $24 per person, with a case (6 four packs) per customer limit. _____ To make the release even more rad we’re doing another corn dog collab! This time with our Highland Park buds @bellesbagels! _____ See ya’ll this Friday (12/7) at 2PM!